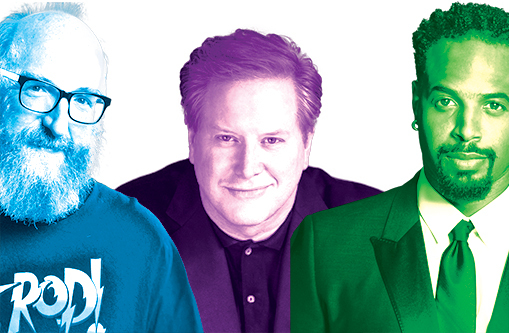 Performers at the Cinema & Drafthouse have included Brian Posehn, Darrell Hammond and Shawn Wayans. Whether the headliner is Trevor Noah, Amy Schumer or Patton Oswalt, you’re bound to find a famous face onstage most weekends at this landmark Art Deco theater (built in the 1930s) on Columbia Pike. Co-owner Tim Clark credits the crowd for attracting top talent. “It’s always a smart audience here,” he says. “[The performers] are able to do different material that they probably can’t do in other parts of the country.” These days, the Drafthouse is ramping up its efforts to bring even more comic relief to Arlington. “We are getting bigger names. You’ll see that in 2018,” Clark promises. Former Batman Val Kilmer will be here in February to introduce a special film screening of his one-man show, Cinema Twain, in which he embodies the legendary 19th-century American storyteller.